..please update us in rice races - eg will camdodia treble its rice exports in next 2 years?. 4.1 there are hundreds of types of rice seeds; soil analysis matters as does a profile of what are the main challenges locally (and is climate changing these?) -different vraiants are needed if there is too little or too much water; different variant are needed if midday sun gets too hot etc -much rice is grown in deltas of big rivers potentially most at risk to climate? 5 it is predicted that rice will become the main crop of sub saharan africa within 10 years replacing maize- in terms of womens empowerment burindi is a very exciting case- during an amnesty men were swapped jobs for arms - because the women didnt have any arms they were left out until job creating with rice became a major womens program -with a little help from the howard buffett foundation and CARE Burundi -within 3 years " a new IRRI-Eastern and Southern Africa Regional Office opened in Bujumura, Burundi. This will serve as a regional rice research hub to help support the development of the rice sector in Africa." Director General GDA (General Directorate of Agriculture, Cambodia)... was extremely supportive of the event and showed keen interest to know more about such initiatives of Grameen Intel. He sees this program scaling across the country to upcoming ASPIRE program and others; and not just limited to rice, but other cereal, vegetables and fruits. 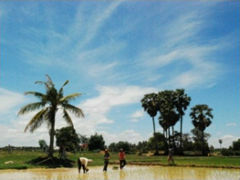 In Cambodia Grameen Intel’s farming software applications will focus on farmers engaged in rice production. Farmers can also get benefit from seed selections, pesticide recommendations and marketing pricing information from wide ranges of unique software applications of the company. It may be mentioned that Grameen Intel offers a range of revolutionary agricultural software applications to cater modernized scientific farming and enable farmers to achieve sustainable high yield on their crops. These software applications have already been deployed in different projects in countries like Nepal, Bangladesh, India and Macedonia. These software applications can provide all kinds of agriculture related suggestions in a variety of categories including for seed selection and recommendation by ānkur software, soil nutrient analysis and fertilizer recommendation by mrittikā, crop protection recommendation protikār and direct market or buyer information to farmers by vistār software. The combination of all these applications is believed to be revolutionary in crop production. These software applications are fully designed and developed by product development team of Grameen Intel Social Business Ltd. in Bangladesh. IRRI’s objective in Burundi is to enhance the national capability in research on rice and rice-based systems in the country. IRRI first started working in Burundi in 2008 when a Memorandum of Understanding (MOU) between the country and IRRI was signed. The beginnings of this agreement were first born when current IRRI Liaison Scientist and Coordinator for Burundi, Joseph Bigirimana, attended the Rice Research to Production Training Course at IRRI in 2006 where he met with IRRI management. Following this preliminary meeting and further work by Joseph in Burundi, the Burundian government officially asked IRRI to collaborate with it. In 2006, IRRI sent experts to Burundi to investigate the rice production environment and saw there were opportunities for collaboration. IRRI has since established an office in the capital Bujumbura within the campus of theUniversity of Burundi, where laboratory and other facilities are shared with the Faculty of Agricultural Sciences. IRRI now employs 19 staff in Burundi including a regional coordinator, two regional breeders, six researchers, eight technicians, and two administrative assistants. In 2009, the first joint project with CARE Burundi was established with support from theHoward Buffett Foundation to train ex-combatant women in rice production. IRRI is also sharing rice breeding lines with Burundi that are being tested at a number of IRRI field sites around the country in different rice production ecologies. In November 2010, two Ministers of Burundi government visited IRRI fields on the Imbo plain. The two Ministers were Prof. Julien Nimubona, Minister of High Education and Scientific Research, and Ir. Odette Kayitesi, Minister of Agriculture and Livestock. They were accompanied by the Vice-Rector of Burundi University. In their speeches following the visit, both Ministers congratulated IRRI for its important role in food security in Burundi. They also highlighted rice as one of the government’s priority crops for the country and encouraged IRRI to continue with rice research. In October 2013, a new IRRI-Eastern and Southern Africa Regional Office opened in Bujumura, Burundi. This will serve as a regional rice research hub to help support the development of the rice sector in Africa. 02 May 2013, Dhaka. Dr. Mahabub Hossain, executive director of BRAC, has been selected as one of the 500 most powerful people in the world by Foreign Policy – a global magazine of politics and economics. Dr Hossain is the only one chosen from Bangladesh to have claimed a position in this very prestigious power map. The Foreign Policy adheres to a ‘list of lists’ approach by which they consult various distinguished and globally influential sources like Fortune Global 500, Forbes World’s Most Powerful People, World 500, Top 100 NGOs, International Media Corporations, World University Rankings, Wall Street Journal Market Watch and such others, and pick 500 people who have proven to possess the outstanding capability of influencing global trajectories. 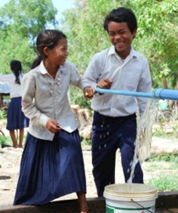 In February 2013, BRAC was ranked number one among the top 100 NGOs in the world. Dr Hossain joined as Executive Director of BRAC in June 2007. Prior to joining BRAC, he was head of the Social Sciences Division at the International Rice Research Institute (IRRI), Philippines, and coordinator of the Consortium for Unfavourable Rice Environments (CURE) in Asia. 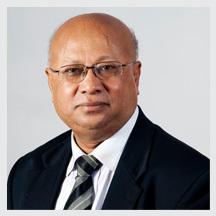 Dr Hossain began his career in 1970, as a staff economist at the Bangladesh Institute of Development Studies (former PIDE) and rose through the ranks to become its director general during 1988-91. He also worked as a visiting scientist at the Institute of Developing Economies in Tokyo (1981), the International Food Policy Research Institute, Washington DC (1985-87), and the Overseas Development Institute, London (1990). Dr Hossain received his MA in Economics from Dhaka University in 1969 and PhD in Economics from Cambridge University, England in 1977. His major area of research interest is on the rural development policies. Dr Hossain serves as a member of the Board of Governors at Bangladesh Agriculture University, Mymensigh, and BRAC University. He is a founding member of the North-South University Foundation, and a member of the Advisory Council of the CGIAR Harvest Plus Project run by IFPRI and CIAT, the Rice Advisory Council of the Syngenta Corporation for Asia and the Pacific. He is the Chairperson of Bangladesh Rice Foundation, a civil society think tank on rice policies. He is also a member of the Global Knowledge Advisory Commission of The World Bank. In his book 1493, Charles Mann cites Eighth Wonder and RICE, Inc. as a "ray of light" for the Cordillera rice terraces. Raymunda Mamaril, representing theominio rice producers of Barlig, Mountain Province showcased the dark purple sticky rice in a traditional dessert at a 2012 Salone del Gusto and Slow Food Terra Madre tasting workshop in Turin, Italy. Read more at our blog. Eighth Wonder Kalinga Unoy is now being served at Marco & Pepe Restaurant, 289 Grove Streer, Jersey City, NJ 07302. If you are in the area, check out this highly acclaimed restaurant. The Provincial Government of Ifugao awarded a Certificate of Recognition to the Rice Terraces Farmers Cooperative (RTFC) as a producer of an Ifugao certified product. The RFTC is our coop partner in Ifugao. Follow the Heirloom Rice blog and Facebook page for the latest updates on the project. IRRI works closely with rice science networks in major rice-growing nations. We partner with national agricultural research and extension systems, helping IRRI’s research reach where it is needed the most. The nations below play a vital role in sharing our research and adapting our technologies to their local conditions and needs. This broadens our reach and multiplies our impact. Bangladesh’s partnership with IRRI goes back more than 45 years. IRRI's first outreach program in Bangladesh was in 1965 -- when a set of 303 rice varieties, which constituted the Institute's first international rice testing program, was evaluated at Savar Farm, a government-run dairy enterprise. This was with support from the Ford Foundation. The following year, the first widely distributed high-yielding semidwarf rice variety, IR8, was introduced into the country. As a result of food shortages in the late 1970s, many farmers were forced to eat their rice seed and traditional varieties were lost. In the 1980s, IRRI reintroduced more than 750 traditional Cambodian rice varieties to Cambodia from its seed bank in the Philippines—a vivid demonstration of the foresight that created the bank in the 1960s. Iran and IRRI's collaboration started in 1976, and IRRI scientists have since visited Iran to monitor existing projects in the country and several work plans have also been signed to support these collaborations and capacity-building partnerships. Mozambique has a 500-year old tradition of rice cultivation. Today, rice is seen more as a cash crop. Most of the farmers produce rice, but don’t eat it. IRRI was first established in Mozambique in 2006 with a mandate to increase rice production and build capacity to sustain the country’s rice industry. Cooperation between the government of Nepal and IRRI began in 1985. This covers research on improvement of rainfed lowland and irrigated rice varieties, plant pathology, entomology, soil science, agronomy, and farming systems. Rice is famed to have had a long and regal history in Sri Lanka. Its importance goes far beyond its status as a primary food source in this island nation. Synonymously, rice plays an important role in the country's cultural identity, tradition, and politics. The Socialist Republic of Vietnam and IRRI have been partners since 1963, in a wide range of collaboration in the fields of rice breeding material exchange, rice varietal improvement, resource management, and capacity building. Since then, a total of 89 IRRI breeding lines have been released as varieties in Vietnam. IRRI varieties now cover 70% of the rice-growing areas in Vietnam. Rice has become an important crop for Burundi, which increased its rice production by 316% between 1984 and 2011. In 2010 Burundi was importing about one-third of its rice and making efforts to further increase production. IRRI has been officially collaborating with Burundi since 2008. IRRI and China have been collaborating for more than 30 years. A key partnership was in a mega-project which began in 1997, intensively focused on rice research and training. This huge undertaking of 12 collaborative projects resulted in 49 super rice varieties being released in China since 1999. Yields increased to as much as 12 tons per hectare. Indonesia’s rice consumption in 2010 was more than 139 kilograms per capita per year and is among the highest in the world. IRRI estimates that Indonesia will need 38% more rice in the next 25 years, which means that the average yield of 4.6 tons per hectare must rise to more than 6 tons per hectare to fill the gap. Lao PDR-IRRI collaboration began in the late 1960s and the first memorandum of understanding (MOU) between Lao PDR and IRRI was signed in 1987. IRRI began its first initiative in Pakistan in 1966 when the Ford Foundation decided to fund IRRI directly to hire rice specialists. It was through this arrangement that Kenneth Mueller was hired as a rice specialist to lead the Pakistan accelerated rice production project. Through the Rural Development Administration (RDA), the Republic of Korea (commonly called South Korea) has been collaborating with IRRI since the 1960s to breed the temperate Japonica rice variety with the tropically grown indica variety. As far back as 1941, Thailand recognized the importance of deepwater rice research by building the Huntra Rice Experiment Station. The first formal link between Thailand and IRRI was made in 1960-1963 when Prince M.C. Chakrabandhu became a founding member of the IRRI Board of Trustees. participatory varietal selectioni nvolving farmers. Improved ricevarieties that are approved forrelease by some countries are alsoconsidered. Five ARICA varieties—three for rainfed lowland and twofor upland ecology—were selected in2013. has proven to be a very eectiveapproach,” explained Dr. Manneh. More than 30 stress-tolerant ricevarieties have already been releasedin nine African countries withsupport from the STRASA project,according to Dr. Manneh. However,as they were developed before thelaunching of the ARICA brand, theywere not nominated as ARICAs. toxicity, can occur at the same time. The rice varieties that are beingdeveloped will help overcome thehurdles imposed by the widespreadenvironmental stresses that limit riceyields in Africa.“To achieve this, we willstrengthen our collaboration withdevelopment partners who havethe capacity for rapid deliveryof improved rice varieties to ourfarmers,” Dr. Manneh added. Ms. Mohapatra is the head of Marketingand Communications at AfricaRice. ice is important to thepeople and the economy ofNepal, where agricultureemploys around 80% of thepopulation and contributes 37% tothe country’s gross domestic product.Rice is grown on more than 1.5million hectares, producing a total ofabout 5 million tons and an averageyield of 3.3 tons per hectare in 2011-12. NGO personnel were conducted onusing the NRKB and developing factsheets.From 1980 to 2008, Nepal andIRRI partnered on some projects aspart of the Rice-Wheat Consortiumfor the Indo-Gangetic Plains. Theseprojects became a platform for arange of on-farm and on-stationsystem research supported by theAsian Development Bank (ADB),Department for InternationalDevelopment, the International Fundfor Agricultural Development (IFAD),the U.S. Agency for InternationalDevelopment, World Bank, and theBill & Melinda Gates Foundation,and evolved into the Cereal SystemsInitiative for South Asia (CSISA)project in 2009.From 2005 to 2008, NARC andIRRI completed three collaborativeprojects funded by ADB and IFAD. of the cost in land preparation andseeding.Laser land leveling, directseeding, unpuddled transplantingof rice, and reduced tillage on wheat,maize, lentil, and winter maizehave all been adopted by farmers toimprove their management practices.Residue management, the use of a leafcolor chart for nitrogen management,weed management, rotation withother crops, and other practices havealso contributed to higher overallcrop productivity.Seed growers also receivedtraining on quality seed productionand establishing linkages withresource centers as sources of qualityseeds and market information. Sub1 and Sambha Mahsuri-Sub1 werealso released to help farmers in thesouthern Terai. To date, NARC hasreleased 69 rice varieties for bothirrigated and rainfed environments,with IRRI genotypes contributingmore than 60% of the varietiesreleased in Nepal. technicians, NARC scientists, andfarmers. Moreover, the projectfocuses on promoting resource-conserving technologies for rice,maize, and lentil. production technologies for bothrainfed and irrigated ecosystems,including varietal improvement and best management practices. IRRI willwork with NARC in strengtheningcapacity in hybrid rice, postharvesttechnologies, socioeconomic andpolicy research, the rice seed sector,and capacity building of scientiststhrough training activities.The collaborative programwill be pursued under the sixthemes of the Global Rice SciencePartnership (GRiSP), the CGIARresearch program on rice. IRRI beganlinking the dissemination of ricetechnologies with other bilateralprojects related to climate changeand food security in the country.And, this work will continue inthe future for the wider adoptionof climate-smart rice as well asdiscussions on fund raising on riceresearch and development for Nepal. Ms. Ferrer is a science communicationspecialist at IRRI. FAOSTAT,2012.n Malayalam, the predominantlanguage spoken in the Indianstate of Kerala, Regulus, the10th asterism, consists of asickle shaped group of stars in thefront of the constellation of Leo. resign from my post to get a PhD,”she said. happily looks back on her path evenas she contemplates new trails to blazein retirement. For now, she savors thetime she spends with her husband,their two sons, Carlo and Ivan, anddaughter-in-law, Myles. “Andre, mygrandson who is the apple of our eyes, just gained a new regular playmate,”Dr. Paris laughed. Ms. Baroña-Edra is a sciencecommunication specialist at IRRI. BEHIND THIS successful woman is her family whohas enabled Dr. Paris to pursue her passion ofempowering other women. n the coastal polder zone ofBangladesh, satisfying fooddemand and improving thelivelihoods of about 8 millionpeople while at the same timepreserving natural resources aremajor challenges. together expertise and data frommany organizations to answerquestions on how productivity in acomplex and fragile environment can be sustainably increased. Dr. Chandna is a researcher in remotesensing and GIS modeling in the SocialSciences Division (SSD) at IRRI. Dr.Nelson is a geographer and head of theGIS laboratory at IRRI. Mr. Khan isa principal specialist at the Instituteof Water Modeling in Bangladesh. Dr.
of the Soil Resource DevelopmentInstitute in Bangladesh. Mr. Rana, isan assistant engineer in the GIS Unitof the Local Government EngineeringDepartment of Bangladesh. Mr. Rashid isan executive engineer at the BangladeshWater Development Board. Dr. Mondalis a collaborative research scientist inthe Crop and Environmental SciencesDivision and SSD at IRRI. Dr.Tuong isan IRRI consultant. to ooding, drought, and cyclones. levels of suitability for this croppingsystem. Once this model is in place,spatial datasets for each requirementare collected, and areas that arehighly, moderately, marginally, or notsuitable for a shrimp-rice system can be mapped. Extrapolation domain map for shrimp-rice cultivation. Bhutan, a small South Asian country wedged between India and China high in the Himalayas, has some of the most spectacular rice landscapes on theSubcontinent. Here in Trashigang District in the extreme eastern part of the country, the rice harvest has begun in mid-October. HRDC has 68 members nearlyequally represented by the public andprivate sectors. The new partnershipmodel also resulted in a more stablefunding base and opened up a wholerange of partnership options for IRRI,especially with private companies. “mother ship” that unied all theseeorts.
) interactsin the ﬁeld with his AfricaRice counterpart MarcoWopereis and local farmers. what he called “too much short-termthinking and too much short-termfunding.”“People were talking about‘mega-programs,’ but seemed unclearon what those might look like,” hesays of the 2008 meeting. “We felt thatthe best way forward was to create anexample.”On the way back fromMozambique, he and IRRI DirectorGeneral Robert Zeigler visualizedwhat an integrated global programon rice that combined the missionsof IRRI, the Africa Rice Center(AfricaRice), the rice program of theInternational Center for TropicalAgriculture (CIAT), and hundreds ofother partners worldwide would looklike. plan was endorsed by CGIAR andmajor national partners in Africa,Asia, and Latin America. “We alsodiscussed this a lot with the donors,and they were very encouraging,” Dr.Dobermann adds. new research program of CGIAR—is “still very much the standard”for the consortium's other researchprograms. sta, more interdisciplinary work,and beer interaction with partners. To have the greatest impact, Dr.Dobermann believes IRRI mustmaintain its focus on high-qualityscience instead of moving too fardownstream into areas for whichother organizations may have thecomparative advantage.“IRRI needs to focus oninnovations for the future, but thesemust be demand-driven and veryclearly linked to real-world solutionsneeded by farmers and others alongthe value chain,” he says. Ms. Baroña-Cruz is a writer-editor atIRRI. DURING THE 150th crop of IRRI's Long-Term Continuous CroppingExperiment, Dr. Dobermann discusses the sustainability of intensive ricecropping with his successor Matthew Morell (see news item on page 5). Soon after I arrived in Cambodia, I made a trip to see a few of the activities that USAID supports to improve the lives of rural Cambodians. Agriculture — especially rice — is of huge importance to Cambodia and I was able to see how our support is helping farmers become more successful by introducing new techniques. I also saw how our funds are improving Cambodian children’s education by strengthening school facilities and increasing their knowledge about nutrition. Not far from Cambodia’s most famous landmark, Angkor Wat, farmers in Siem Reap and Kampong Thom provinces are learning about better, more efficient ways to raise fish and grow crops and vegetables. In addition to the training and supplies they receive through our food security program, USAID HARVEST, rural families are also eating better as a result of the nutritional information provided by HARVEST’s trainers. The bottom line is that their production is allowing farmers to earn more income and provide their families with a more diverse and nutritional food basket. Greg Beck, USAID’s Deputy Assistant Administrator for the Asia Bureau, saw this when he enjoyed personal interaction with one such farmer during his visit this year. 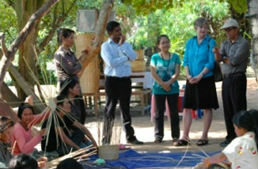 Read about his reflections on his Cambodia visit here.